I swear this works. The first time I heard this advice I thought I was being pranked, but after research I learned that it actually keeps your feet warm. The first step you need to do is put your socks on. 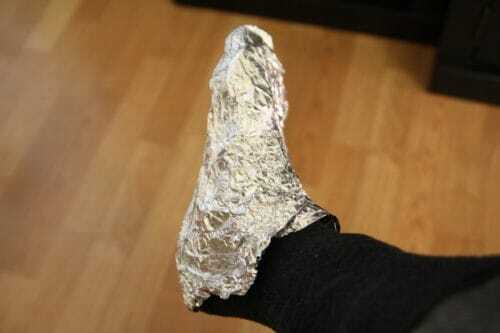 Next take a portion of aluminum/tin foil and wrap your foot with a single layer. Some cyclists only suffer from cold toes and will only wrap the front toe portion of their feet. I can’t stand cold feet, and so I wrap the entire foot. You literally want to wrap your foot with foil as if it’s a hot potato. The layer of tin foil will help keep your feet insulated with heat. You may feel like a dork wrapping your feet in aluminum foil, but the results are real. One of the reasons your feet may be cold while cycling is that your core is cold. When the temperature of your overall body drops, it will respond by reducing the blood flow to your extremities such as your hands and feet. Hence the reason why your hands and feet are the first things to go cold and numb when you’re out riding in the cold. This is a physiological survival technique that your body undergoes to protect your vital organs from getting cold. Instead of focusing on your extremities, it focuses blood flow and warmth to your vital organs. You can help keep your hands and feet warm by keeping the blood flow heading in their direction by ensuring that you’re wearing enough clothing to keep your core warm. 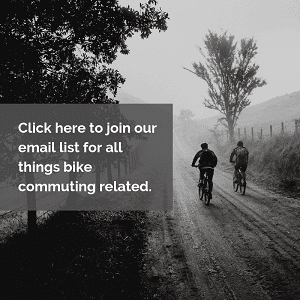 If you’re bike commuting in the rain you may have got your feet wet. A damp or wet foot is an easy culprit for cold feet. Protect your feet from the rain by purchasing waterproof socks (see on Amazon) for wet rides. You could also wrap your feet in plastic grocery bags if you’d like to go the cheaper route. Believe it or not, there are cycling shoes that are made specifically for the winter. They are created to keep your feet warm in even the worst of weather situations. These winter cycling shoes are bulkier than regular cycling shoes, but they will keep you warm and allow you to clip into your pedals. Most of these shoes are waterproof as well as they can be used in rain or snow. Plan on purchasing a pair of winter cycling shoes that are a size larger than you normally wear. This extra space will allow you to wear extra or bulkier socks while you ride. The only downside of winter cycling shoes is that they can be expensive and only useful during winter seasons. If on your bike commute you wear normal non-cycling specific shoes such as a pair of Nikes, you should think of switching them for a pair of winter boots to help keep your feet warm. You could always carry the shoes you need to work in your backpack/pannier while wearing heartier shoes that will keep your feet warm until you arrive at your destination. Get yourself a nice pair of wool socks and your feet will be thankful. Cotton socks are terrible for riding in cold temperatures, because they are poor insulators compared to wool. You would be surprised the difference wool socks can make. Great winter cycling socks aren’t too thick, because they can restrict the circulation to your feet. You’re looking for a sock that will keep you warm without the bulkiness. The best cycling socks are made of merino wool. Merino wool is quick to dry, has the ability to wick away wetness, regulates temperature, and is anti-bacterial. 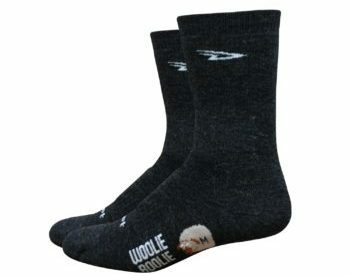 There’s lots of options for wool socks out there, but I would recommend the Woolie Boolie 6-inch wool sock (see on Amazon). They’re versatile enough to not only cycle in, but wear for everyday use. They’re not tall socks, but only 6 inches. And most importantly they are comfortable and keep my feet warm. 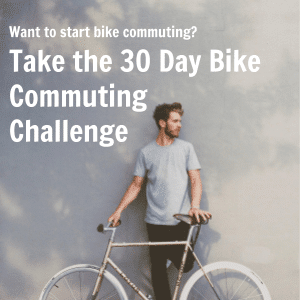 As a bike commuter I like them, because I don’t need to change my socks when I get to work. If you’re wearing cycling cleats you should invest in a pair of toe or shoe covers. They’re made of different materials such as neoprene, nylon, and other winter-proof materials. Toe covers will fit onto the front of your cycling cleats. Their purpose is to cut down on the wind that blows into the vents of your cleats. These vents allow your feet to breathe during nice weather rides, but let the cold in during the winter months. The other option is purchasing shoe covers. These will completely cover over your entire shoe to protect it from rain, wind, and the elements. Pair your shoe covers with wool socks and you’ll never have to worry about cold feet again. I would recommend looking into the Showers Pass Club Shoe Covers (view on Amazon). They will be able to do the job of protecting your feet while fitting over most shoe sizes. Many bike commuters use these and have found them great at not only keeping their feet warm, but their shoes nice and clean while on the way to work. A win-win! If it’s really cold outside than you should wear an extra pair of socks. No one would go outside in freezing temperatures wearing only a t-shirt. You layer with a t-shirt, than sweater, and maybe even a winter jacket. In the same way, you should layer your feet to help insulate them from the cold. I would recommend two to three layers for your feet as long as you have the space in your shoe. You could start with a thin, silk sock on your feet, and than a warmer sock over that. Wool socks are great for the outer layer, because not only are they warm, but they are able to stretch out to fit over the extra socks on your feet. I’ve read about other cyclists who will put chemical warmers in their shoes to get the heat going. Sounds strange, and to be honest – I have not done this. The downside is that you’ll need to squeeze these warmers into your shoe, and not everyone has the space to get them in there. From the recommendations of others, they suggest putting the warmer directly over your toes. You can purchase the toe warmers at Amazon here. Another odd way of keeping your feet warm, but it works. Put your socks on, and than place your foot into a plastic produce bag before putting your shoes on. The plastic will help keep wind and moisture off your feet. As a bonus you’re helping reuse those plastic produce bags! Good Luck Keeping Your Feet Warm While You Ride Your Bike! Thinking about my feet going frozen is enough to keep me off of the bike. No one wants to go for a bike ride with their feet throbbing from the cold. 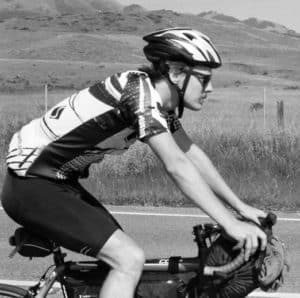 Thankfully there are a variety of tips and techniques that you can use to prevent your feet from getting cold while cycling. 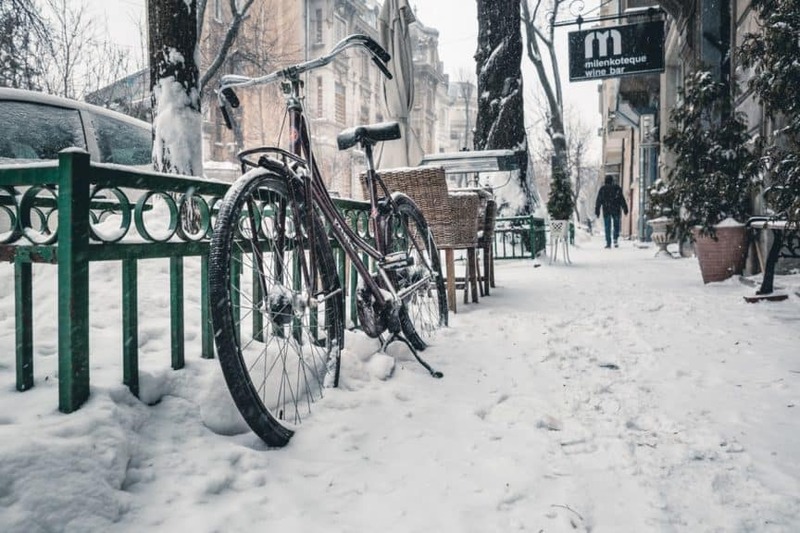 Don’t let the cold weather be a deterrent to ride your bicycle! Get yourself a nice pair of wool socks, bundle your feet in aluminum foil, and start pedaling.